Casa Grande is entered by a secured gated driveway to the front of the property with plenty of parking space. The generous main entrance Italian vaulted door opens into the expansive open plan living/dining area with 180-degree sea view, a Baby Grand Piano and access to the covered Alfresco dining areas. This area caters for internal dining if required and has a fully integrated entertainment system. The spacious kitchen has been designed to comprise the latest in technology with an inside breakfast bar and grill facility and the living room has full Sky package available, Blue Ray and Bose sound system. The villa has 5 ensuite bedrooms in the main house and 3 ensuite bedrooms in the guesthouse and is built over 2 levels. 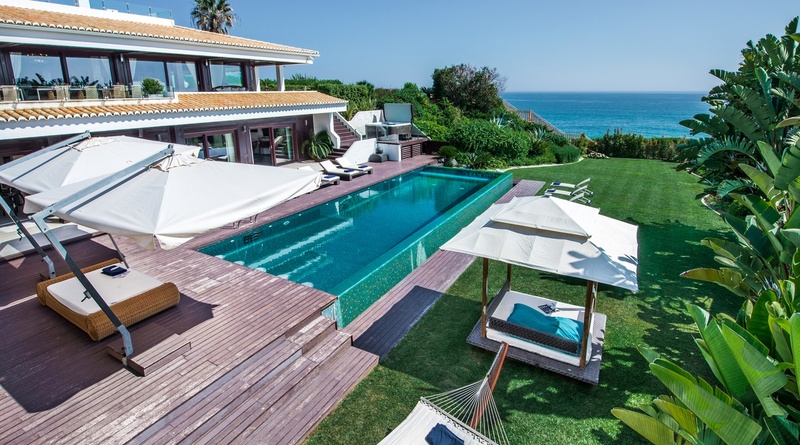 The villa also benefits from stunning views over the sea and has direct access to the beach from the garden. Step outside to the pool area and discover the classically designed rectangular infinity pool constructed using the finest Italian Bisazza tiles shimmering in the sun. The pool has a motorized cover and can be heated by a supplement. Rest awhile at the pool bar on the underwater bar stools or unwind in the poolside Jacuzzi. Plenty of sunbeds are available as well as 2 double beds, one with a permanent shade. Extensive wood decking provides more than enough lounging space set in mature gardens with manicured lawns. The covered terraces with professional gas barbecue feature magnificent dining tables enjoying panoramic views by day and the twinkling lights of local fishing boats by night. 1 x The Gold suite with double bed, plasma TV and ensuite bathroom. 1 x The African suite with double bed, dressing area and unique motorized glass ceiling which opens at the touch of a button allowing bathing under the stars.